This entry was posted in genre comparison, interpretive theory, methodology by tedunderwood. Bookmark the permalink. Well put, Ted. And I agree that quantitative methods — or the attempt to develop them — help us think about concepts that are otherwise easy to take for granted. I’ve seen that in my own work with allegory. I wonder a little bit, though, about the larger claim that the humanities have any special purchase on skepticism. I guess I’d say that we tend to think about big, amorphous problems, so maybe we see more way-off-base approaches and are therefore somewhat more attuned to that possibility. But aren’t we really just talking about doing good academic work? Question your assumptions, contemplate the possibility that you could be coming at things from the wrong angle, etc? Wouldn’t good chemists or psychologists or political scientists do the same thing? It’s not that I think the humanities are bad at this (or anything else, really). It’s just that I’m not convinced in the end that there’s any uniquely “humanities” approach to knowledge. I’d say that there are humanities *objects* of knowledge and that those objects can reward some methods more than others. But to me, skepticism indicates an orientation within epistemology itself. I say all this because I’m a little put off not by anything you said, but by the larger conversation about preserving the humanities. I hear a lot of noble sentiments about how the humanities should be supported because they (alone, I think, is the implication) foster critical thinking, skepticism, analysis, etc. And all I can think is that it must be news to people in other disciplines that they’re not interested in (or good at) those things, and that it mostly just makes us seem ignorant for suggesting as much. I guess I’d say there are things to export from the humanities, but those things are methods for dealing with classes of objects rather than any epistemic outlook. I think I mostly agree with this, Matt. I also tend to be put off by the kind of idealization of the humanities you describe. And I would firmly agree that there’s no uniquely “humanistic” approach to knowledge; that’s exactly what I mean to imply when I say we don’t need any firewalls. The post does probably overstate how much of a comparative advantage humanists have at questioning foundational concepts. But the overstatement is a slip due to rhetorical compression more than a settled opinion. I don’t actually think resistance to reification is unique to the humanities. I know that it sounds that way when I talk about “exporting” it, but of course lots of scientific disciplines are very thoughtful about their core concepts. I know that psychologists question whether there’s actually an entity called “personality,” etc. In the end I’m less interested in the import/export business than in acknowledging a broader tension between critiques of accuracy and critiques of conceptual framing, which could play out in any field. Ah, on this I agree entirely. And I’m really, really interested in problems of historical continuity/discontinuity. I have the Kindle sample of your book on my iPod and am looking forward to reading the whole thing. My own manuscript is about the mechanics of periodization, but/and a lot of the computational work I’ve seen makes me think that the story is even more complicated than the version I’ve worked out in the past. Oh well … next book. Great post! It’s coming from a quite different place, but you might enjoy Jenn Lena’s work on genre in music. Her argument is that genre isn’t a coherent set of elements in the work, but rather a way of organizing communities of producers and consumers. I’m not sure how well it’d apply outside of the context of 20th and 21st century music, but might still be of interest. Thanks, Dan! I’ll take a look at that. There are similar socially-based theories of genre in rhetorical theory: Carolyn Miller and Amy Devitt are especially good. I think recognizing genre as a social phenomenon is a helpful first step, though it may still turn out that we’re talking about social phenomena of bewilderingly different sorts. Yes! I completely agree and am pleased you raise this point. I’m regularly troubled by how digital humanists deploy genre as though it were either a set of stable taxonomies or merely a box into which we can classify texts. Instead, genres possess structures that do ideological and hermeneutic work. It’s good for me that so few people investigate genre because it’s the topic of my dissertation, but it’s troubling nonetheless (and not at all limited to DH work; it’s endemic in literary scholarship). I’ve found the work of George Lakoff (e.g., Women, Fire, and Dangerous Things) and other cognitive scientists on how the human mind categorizes to be invaluable. Thanks! I’ll check out Lakoff and also keep an eye peeled for your work on genre. I’m doing a lot of work with classification algorithms, but I think if you listen to the algorithms they actually end up telling you that genre isn’t a stable taxonomy. Great post, Ted. I find the issues around genre interesting too. My doctoral thesis identified a new ‘mode’ of writing in New Zealand, so I’ve struggled with the issue myself. One of my supervisors felt it was a coherent enough body of writing to be described as a ‘genre’ but I wasn’t comfortable with that approach, because I could see various corner cases where the strong argument just didn’t work. I ended up adapting Northrop Frye’s ‘theory of modes’. I like the way it allows for variation across bodies of texts, and accepts variations in their socio-cultural function over time as well. This is exactly the issue I struggle with. I feel like the concepts of “form,” “genre,” and “mode” shade into each other fairly smoothly. E.g., a concept like “the gothic” can be divided up in a wide range of different ways, some of which look more like genres (imperial gothic) and some more like modes (gothic romance). On the other hand, our ways of thinking about poetic genre often have a strongly formal character. Not to mention that some genres are a mosaic of other genres — e.g. “the ballad opera” or “life-and-letters.” It’s dizzying. But I actually think this is part of the rationale for a digital approach to the phenomenon. Numbers are very useful when you’re dealing with continuous questions of degree. E.g., instead of deciding whether “Southern gothic” is a genre or a mode we might situate it somewhere on that spectrum. Actually, your post reminded me of Frye, but on checking the few pages on my thesis that directly deal with the issue, I remember Alistair Fowler’s book Kinds of Literature: An Introduction to the Theory of Genres and Modes helped more. I like his notion that modal terms never imply a complete external form; they represent a mixture of various generic elements and are often amorphous and transitory in historical terms. It’d be interesting if you could collapse quantification to that level – of modal attributes – and use the results to critique the value of more rigid forms of generic classification. The relationships between genres and modes could prove fascinating, especially if you could chart their development over time. How you would define and code identifiable modal attributes I don’t know. What I’ve found so far in practice is that forms and genres are pretty easy to identify digitally with bag-of-words methods, and things I would tend to call modes are more challenging. So, e.g. dramatic verse, the Robinsonade, and the Romantic-era gothic novel are things I can train a single classifier to identify. But if I want to identify “the gothic” in a broader sense, I find I can’t do that very well with a single classifier. I would need to train multiple models spread out over the timeline to model historical variability within the mode. But I’ll check out Alistair Fowler’s book; I haven’t read it and it looks useful. I thought about this kind of thing a lot when I began thinking about cultural evolution. There I wanted to liken the biological concept of species with cultural notions of genre in literature style in music. I didn’t get very far, but thinking about the biological side proved useful. What I learned is that we need to think about the relation between classification and causal mechanisms. Until relatively recently biological classification was based exclusively on morphology: creatures that look like one another are assumed to be the same kind of thing. So we group individuals into species, species into genera, genera into families, etc. This worked fairly well though, as always, there were rough spots. Now, let’s add evolution to this picture. Let’s think of Darwinian evolution is a theory about differential survival based on the inheritance of characteristics from one generation to the next. This is a causal process. And it turns out that this process maps rather neatly onto morphological classification schemes (see section 4, Biological Evolution: Taxonomy Recapitulates Phylogeny, Almost, of Culture as an Evolutionary Arena. Individuals of the same species share the same gene pool. And species in the same genus also share a gene pool. And so it is on up the line. This “fit” between morphological classification and inheritance of genes works best in the multi-celled creatures and, among them, it’s best with animals. Animals don’t often form hybrids. Yes, you can cross a horse with a donkey and get a mule; but mules tend not to breed. Hybridization is much more common among plants. The thing about hybridization is that it messes up our nice correspondence between classification by morphology and the inter-generational flow of genetic material. A hybrid creature has parents of two different species. Whoops! There goes the neighborhood. Two different gene pools now come together in a hybrid offspring. And things get a lot worse when we look at single-celled organisms, where so-called horizontal gene transfer is rife. Here there’s even some doubt as to whether the species concept applies. I’ve seen talk of quasi-species. The relationship between morphology and inheritance has become very muddy. Now, one thing biologists have had to do is give up the notion that a species is some kind of essence, an essence that can be usefully characterized by a description. A species is more usefully thought of as a population of individuals, or a gene pool (John Wilkins tells me biologists are working with 22 notions of species). And those are not essences. The important point, as I said, is that we have classification on the one hand, and we have causal processes on the other. There was a time when biologists could think of morphological classification as being neatly aligned with the causal process of genetic inheritance. But things are no longer that neat. And it’s pretty much of a mess when we think of culture. Historical linguists have a fairly elaborate classification of the world’s languages. The classification is tree-like and is taken to be evidence of descent. The classifiction draws most heavily on phonology, and perhaps some syntactic features as well. At the same time we know that horizontal transfer from one language to another is common; words travel freely across linguistic borders. Let’s let that go. There is a logic to this process. Thus it is not surprising that creoles occupy a peculiar place in Rhulen’s taxonomy. Since he can’t really assign a creole to a place based on the parental source of its linguistic core he places them all in phylum of their own, putting the group on the same level as the other phyla, such as Indo-Hittite, Afro-Asiatic (which includes Hebrew and Arabic), Altaic (which includes Turkish and Japanese), Amerind (the native languages of most of the Americas south of Canada), and about a dozen others. Given the complexity of the problem of classifying languages, this is not an unreasonable thing to do. But, even more than the fact that taxonomy doesn’t reflect the rather considerable borrowing that is common between languages, this particular fix obscures a very deep difference between cultural evolution and biological evolution. There is enough hybridization in biology to complicate matters a little, but it always occurs between closely related species. In language, borrowings and creolization are possible between any pair of languages, no matter how remote they are from one another. Distant borrowings, such as those English has from Arabic and Angolan, seem comparable to such biological oddities as a gnat with a gnu liver, a maple with ox limbs, or an eagle with the wings of a dragon fly. Biological creolization would beget snarks from the mating of pigs and sea urchins, and an egress from the coupling of a wildebeest and swamp grass. Such things are not possible in biology. What is true of words and syntactic constructions is certainly true of culture in general. Cultural memes cross freely between lineages in a way that biological genes do not. Where the flow of memes is relatively small in relation to the entire meme complement of a culture we have borrowing. Where the flow of memes between parent cultures is so extensive that the resulting child culture owes significant debts to all parents we have creolization. Because culture is rich with borrowing and creolization we should not expect nor attempt to impose the neat genealogies (with some relatively restricted regions of reticulate interaction between lines) and orderly taxonomic trees we find in biology. What of literary genre? Who knows? One causal process is that of a writer producing a text. That writer can potentially draw on anything and everything to do so. Once the writer has produced the text, it’s put into circulation. That brings in another process. And, of course, chances are the writer has taken the need for circulation into account in the production. Still, the process isn’t nearly so physically constrained as biological reproduction, and that’s pretty messy in single-celled organisms. I don’t see how anything neat and clean can be pulled out of the notion of genre. Literary process is too various and messy. It seems to me we’ve got to ask: what do we want from this act of classification? What kind of causal process are we trying to uncover? And we’re going to have to give up on coming up with a classification process that reveals the “essence” of texts. Wow, Bill — there’s a lot here, and it’s fascinating. I haven’t explored the evolutionary analogy because it does seem fraught with problems like the one you describe. Still unclear to me what would count as “descent” or “selection” in this domain. And I agree entirely with your observations about genre in the last paragraph. What I like about a digital approach to genre, actually, is that it doesn’t presuppose stable categories, and can be entirely provisional. Want to frame the categories differently? That’s fine, just change the training examples and hit “run” a second time. You can’t do that if you’re classifying 469,000 volumes by hand. I explored the biological analogy, Ted, because I have a long-standing committment to the notion that cultural change is an evolutionary process. I looked at biology, not with the expectation that I’d find models that I could appropriate ore or less as-is, but simply to learn something about evolution in a domain where a lot of the details are being worked out. At the same time, lots of those details are in dispute. Surprise! Surprise! I’d say that the main thing I got out of writing that paper, Culture as an Evolutionary Arena, is a better understanding of the relationship between biological classification and the process of evolution. I went into it knowing that, of course, there is some relationship. After all, traditionally biologists have determined whether or not individuals are of the same species, or whether species are related through descent, on the basis of descriptions yielding classifications. In the process of writing that paper I started drawing diagrams (included in the paper of course) illustration the relationship between classification and descent. And drawing those diagrams proved to be just a little tricky and very useful. Nothing deep, but useful. As for “descent” and “selection” in the literary domain I’d say that to a first approximation author determine descent and readers do selection. That is, authors determine what pre-existing stuff – words, tropes, character types, plot elements, over all plot schemes, etc. – what gets into a text. Readers figure out which texts will have an active presence in the culture by their choice of texts to read. Which doesn’t tell you much about anything in your collections. The thing about the sort of work you do is that an obscure text read by only a few readers has the same “wighting” as a popular text read by 100s of thousands. And to work out evolutionary relationships you need to keep track of dates, which can of course be done. But I wouldn’t think that’s a high priority at the moment. Still, geneticists look at piles of genes and, in topic analysis, you’re looking at piles of words. They’re intereted in what genes “hang” together in yielding phenotypic traits and you’re interested in simply identifying groups of words that hang together in context. So there’s crude similarities. And you’re right that the word “classification” is, for most people, scholars included, “going to call up visions of an underlying taxonomic order.” On the other hand “predictive modeling” isn’t going to call up anything at all. It’s a sophisticated concept embedded a conceptual matrix that’s quite different from existing humanistic conceptual schemes. It calls for theorizing of a different kind. That, it seems to me, is where we are. The old concepts aren’t working. The new ones haven’t been created. I find it interesting that Frye’s Anatomy of Criticism is being invoked in this discussion. That book’s over a half century old; it came out the same year, 1957, that Chomsky’s Syntactic Structures came out. I own Fowler’s Kinds of Literature and I read around in it; but I don’t remember it at all. My impression is that he’s playing in pretty much the same conceptual universe that Frye was in, and that universe just doesn’t have the tools we need. A final note. When I was working on my music book (Beethoven’s Anvil) I came across at least two charts (I don’t have any links readily at hand) depicting relationships among styles of popular music in 20th Century America. Neither chart took the form of a tree. Both showed the music riddled with stylistic convergences and divergences. I don’t think either of those charts were based on a rigorous methodology. They were prepared by people who’d listened to a lot of music and knew a lot of the history. The obvious thing to do in this era of “big data” is to digitize all the recordings and then search them for bundles of features that hang together, bundles that break up, and so forth. Chart the history THAT way. I guess that in order to get something like that going you might want to “seed” it with the relationship set forth in those informal charts. Thanks! I definitely didn’t mean to argue against biological analogies; just noting that the analogy would be complex, and I haven’t looked into it deeply. I’d suggest you split drama into verse-drama and non-verse-drama instead. 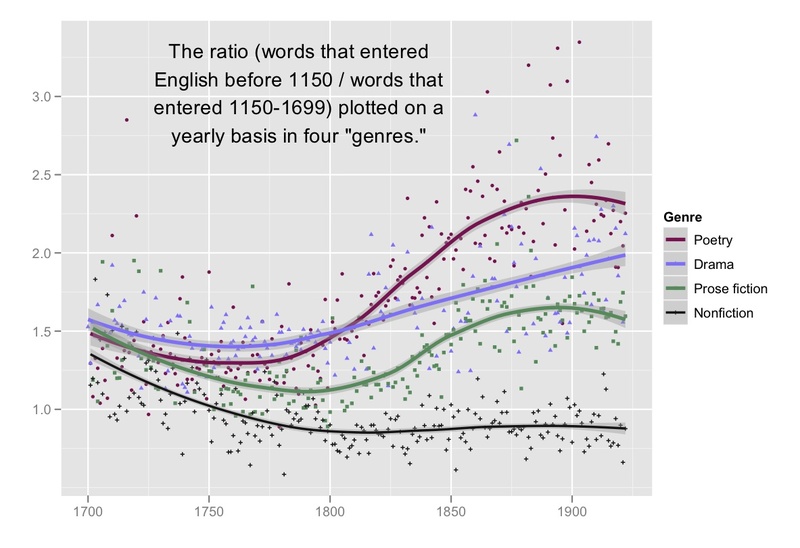 It would better reflect the traditional generic distinction, and would differentiate feature (verse/nonverse) from genre (poetry/drama) more accurately, since there’s plenty of non-verse-drama in your period. I definitely plan to make subdivisions within drama as well. But even the categories of “verse” and “prose drama” overlap in interesting ways. E.g., “ballad operas” tend to mix verse and prose (heavy on the prose), as do lots of verse tragedies (heavier on the verse). The layers of potential complexity never stop with this stuff.